The 17-year-old academy graduate has long been tipped to break into Man City’s first team. PEP GUARDIOLA HAS handed talented youngster Phil Foden his full Manchester City debut for the game against Shakhtar Donetsk in Kharkiv. The 17-year-old will be the youngest Englishman to start a Champions League match, according to Sky Sports. Foden won the Golden Ball as he helped England lift the Under-17s World Cup in October and has long been tipped to make an impact at City. City rejected a number of loan offers for the teen star during the summer and Guardiola, a huge fan of the youngster, insists he will spend the entire season with the first-team. Foden has been with the Blues since he was six years old and was named on the bench for the final Champions League group game last season, but did not see any action. He made his debut off the bench in the last round of fixtures, coming on as a late substitute against Feyenoord. A 1-0 victory in that match assured City of a place in the last 16 as group winners, and Guardiola has taken the opportunity to rotate his squad ahead of Sunday’s Manchester derby at Old Trafford. Ederson, Fernandinho, Leroy Sane and Gabriel Jesus are the only first-team regulars to start in Ukraine. Ilkay Gundogan and Bernardo Silva have played support roles so far this season but both with start on Wednesday, with Yaya Toure also coming into the side. Summer signing Danilo gets a rare start, while 20-year-old centre-back Tosin Adarabioyo will partner Eliaquim Mangala at the heart of the defence. With additional reporting by Sinéad Farrell. Email “Pep hands full Man City debut to hot prospect Foden”. 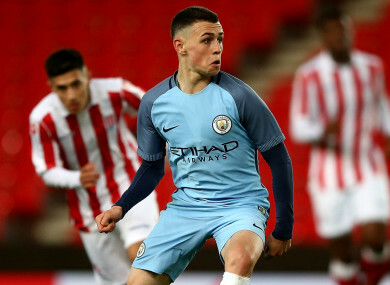 Feedback on “Pep hands full Man City debut to hot prospect Foden”.